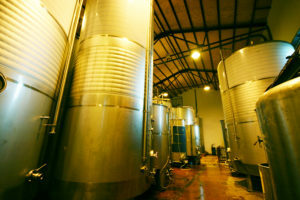 Vino tinto del año elaborado mediante la tadicional maceración carbónica, con racimos enteros, variedad Tempranillo procedentes de agricultura ecológica y sin la adición de sulfitos. 100% tempranillo / 13% vol. la vendimia se realizó la última semana de octubre de 2015 mediante recolección manual y selección de racimos en bodega. Muy limpio y exultante de golosos aromas a frutos rojos (grosellas, moras) y violetas. En boca es muy agradable, frutal envolvente y fresco, sobresaliendo notas de frutos rojos y regaliz. It is the red wine of the year, which has traditionally been produced with carbonic elements, with bunches of grapes wholly owned of tempranillo variety, proceeding from ecological farming without added sulphites. 100% of tempranillo / 13% Vol. The grapes are harvested at the end of October. It is done manually so the best grapes are carefully selected. Most pure, and exultant of gourmet aromas such as red berries (gooseberries, blackberries) and violets. In the mouth is really pleasant, fruity and mesmerizing. Vin Rouge de l´année élaboré de manière traditionnelle carbonique avec des grappes appartenant entièrement au Tempranillo, provenant de L´agriculture écologique sans sulfites ajouté. La vendange de ce vin se réalise fin Octobre de manière manuelle en selectionnant les grappes de rasin. Très pur, et exultant dárômes gourmands tels que les fruits rouges (Groseilles, mûres) et violettes. En bouche, c´est très agreeable, fruité es anvoutant.